Over the past few days, iOS developers Steven Troughton-Smith and TheMudKip have managed to hack the 2nd generation Apple TV to run iOS apps at full resolution. The feat was accomplished using a custom Springboard (Home Screen) written by TheMudKip on a jailbroken Apple TV. Troughton-Smith has since been making progress running iPhone and iPad apps at full resolution. Many existing apps seem to run well on the Apple TV, which is known to be an iOS device using an A4 processor. When this generation of the Apple TV was released, we noted that Apple may have had plans to incorporate native applications all along. In fact, Jobs said that an Apple TV App Store could launch when the time is right. The hack isn't available publicly yet, and remains more of a proof of concept at this time. It's feasible that such a hack could be released to the public at some point to encourage Apple TV specific apps that might be designed to work with the remote interface in mind. Readers should note that the original iPhone jailbreaks enabled native iOS apps well ahead of Apple's official App Store launch. Lights Off was the first native iOS game, released for jailbroken iPhones in August 2007. The official App Store wouldn't launch for another 10 months. it seems to me like apple created a 100$ "computer" that could handle many many average user's needs. they may have realized the effect of this on sales of other products and decided to delay releasing that functionality. 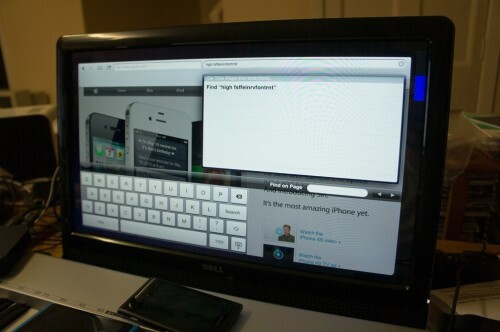 having IOS apps run on an appleTV2 with a wireless keyboard would IMHO be a revolutionary change in the PC market. Love how the Apps fill the screen without modification. Bring on the ATV apps! Nooo! I can't have my wife taking over the big screen with her Angry Birds until football season is over! I want full app enabled iOS for Apple TV and iPod Nano Watch. Sorry, buddy. The iPod nano does not, in fact (http://www.cultofmac.com/57467/apple-touchscreen-ipod-nano-does-not-run-ios/), run iOS. It's actually either the old iPod OS or something like it skinned to look and work like iOS, but I gather the nano just doesn't have the hardware to handle iOS itself. I want to see iApps hacked to run on MACINTOSHES !! Am surprised this made front page news when other fakes have been made more believable than this. It's not fake. I know the dev. Same dev was also responsible for Siri on iPhone 4 hack (https://www.macrumors.com/2011/10/29/siri-hacked-to-run-on-an-ipod-touch-and-iphone-4/). ...you're disagreeing with a mod, who knows the dev. Fail.